Height and weight are measured in various units of measurements and not all of them are comfortable with every unit. Some charts may have weight expressed in pounds while you might be comfortable in Kg or height expressed in cm while you feel convenient with ft/inches. 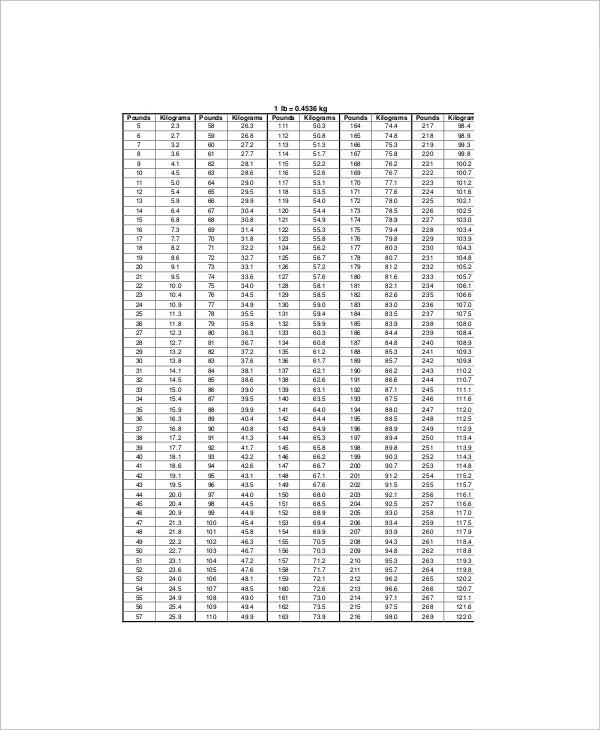 Thus, there are height and weight conversion chart samples whether you need pediatric Height Weight Chart Templates or a chart for adults. 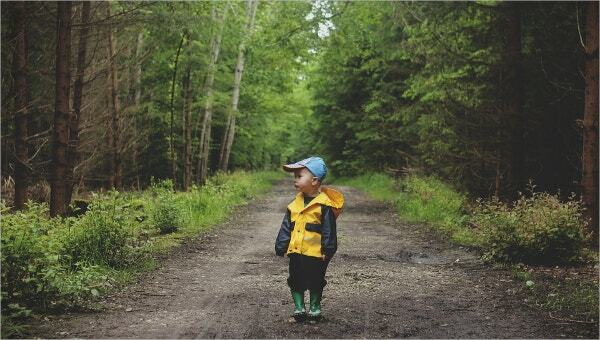 Such charts offer height in every unit of measurements like feet/inches and centimeters. In a similar fashion, the weight would be presented in both pounds and kilograms and sometimes in stone. 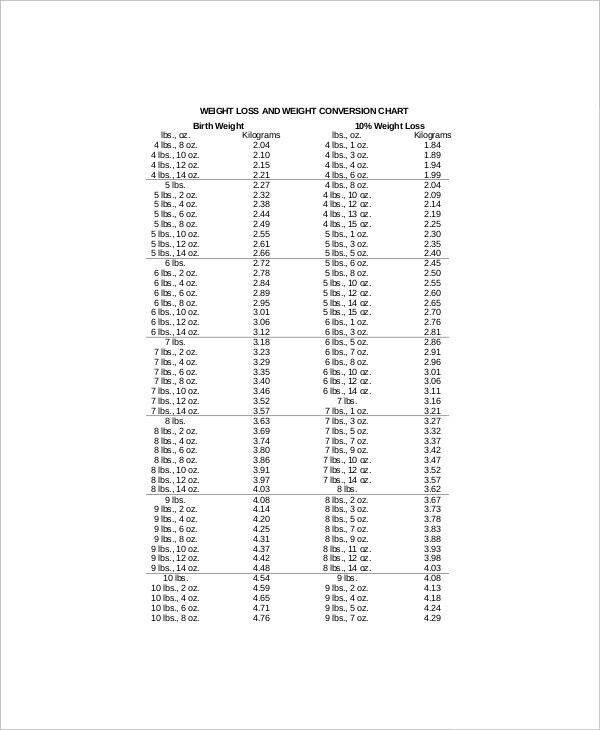 A height and weight conversion chart example is really helpful when you are comfortable in just one unit of measurement. The good part is that there are height and weight conversion chart templates online now that offer a ready-made picture of conversion. This way you would be saved from converting the weight or height metrics yourself when you are not okay with the metric offered by the chart. 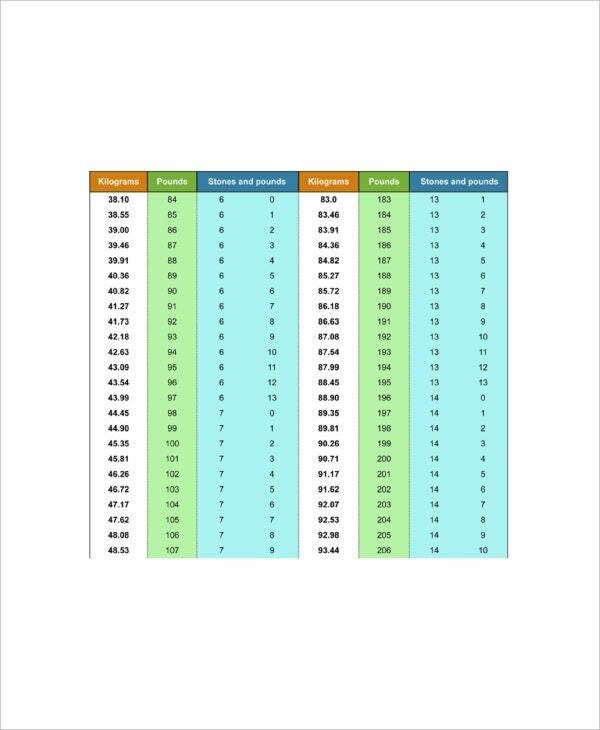 A weight conversion chart from pound to kg example will offer you conversion from lbs to kg metrics. 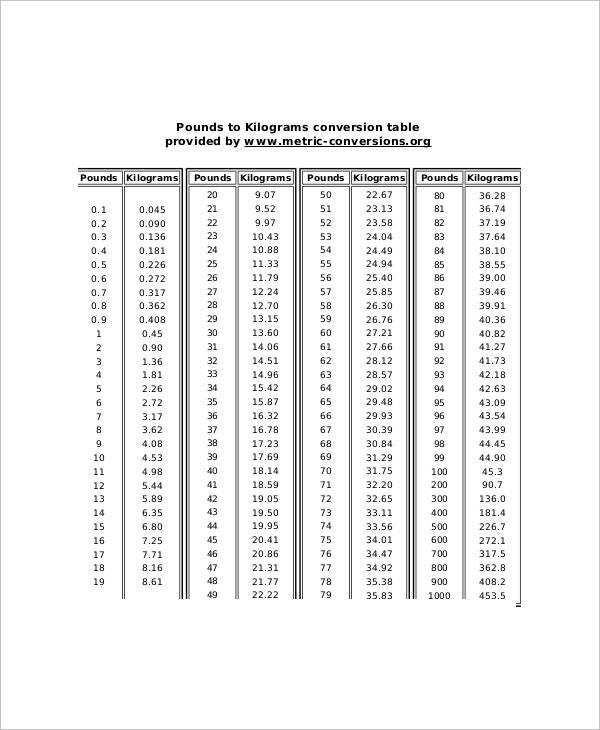 A weight conversion chart from stone to pound sample, will show the conversion of metrics from stone to lbs. These charts may also carry a column for Kg. 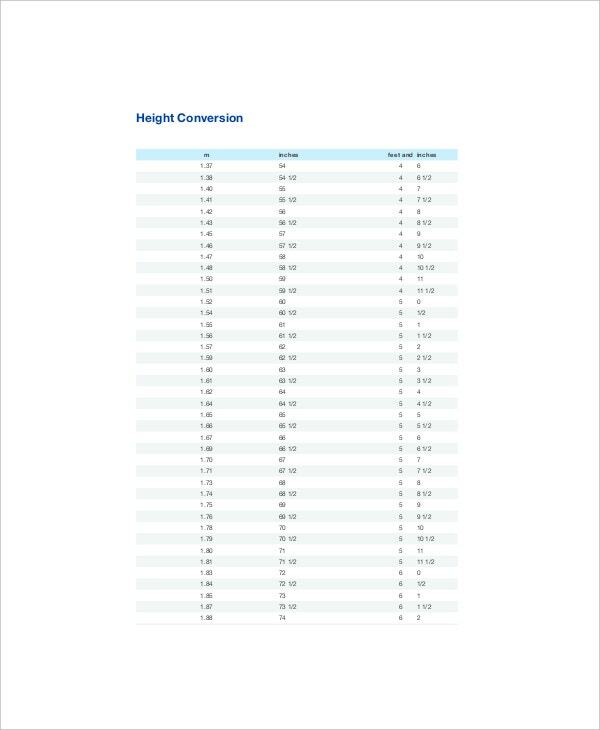 If you want height in cm, a height conversion chart from feet to cm template will show the conversion of height from ft/in. to cm. You can also see Baby Weight Gain Charts. 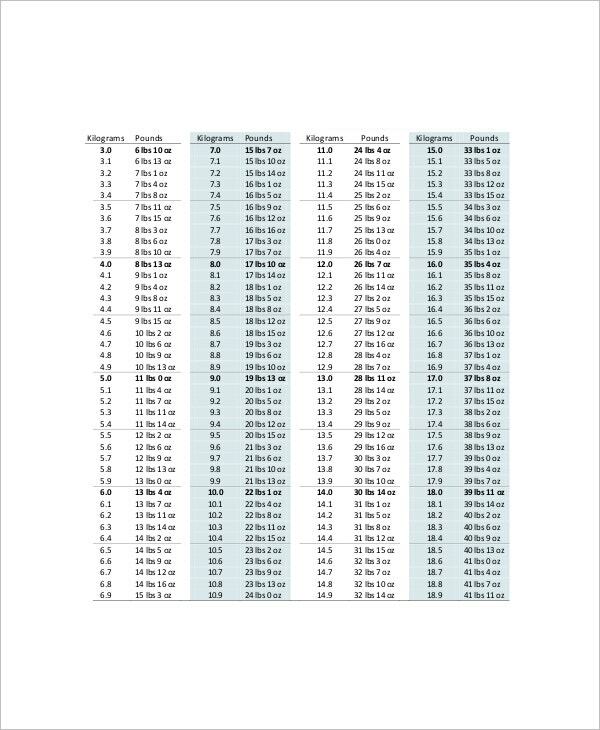 You will also find height conversion chart from feet to m template with metrics converted from feet & inches to meters. One of the biggest advantages of a height and weight conversion chart format is that it assures you an easy understanding of the growth rate, be it for your child or yourself. It’s really daunting to land up with a Height Weight Chart Templates with metrics you are not comfortable with, as you would have to check the converted metrics on your own – which is boring and tiresome. But with the height and weight conversion chart templates, you would simply have to download them and you have a comfortable reading in your preferred converted metric at a glance. These templates are such a time-saver. Charts with pounds to kg conversion will show converted metrics from 2 lbs to 370 lbs. Charts with stone metrics conversion will offer converted metrics from 7 to 15 stones. Charts with feet & inches metrics conversion will offer converted metrics from 1′ 6″ to 6′ 8″. 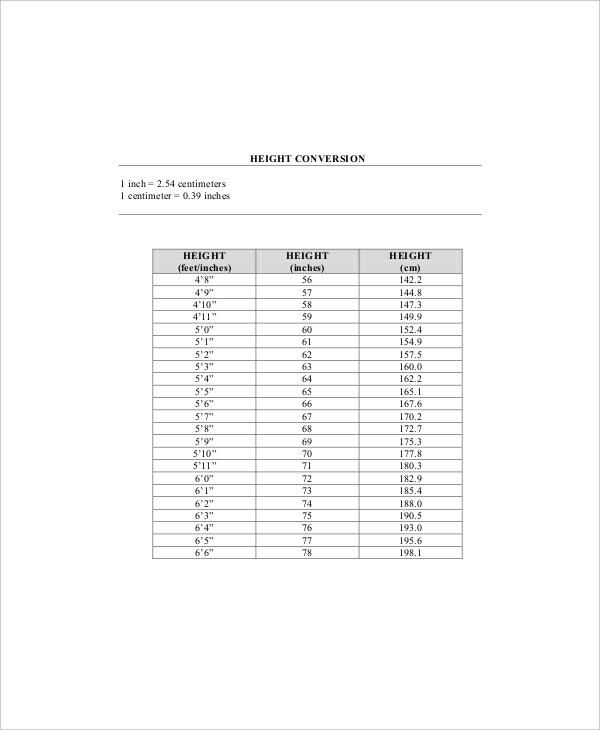 When you are looking for best height and weight conversion chart templates, template.net is the place for you with its professional conversion charts.